A lot of dogs love pig ears. These are animal-based treats that are sourced from the ears of swine. Unfortunately, there are a few safety concerns especially related to the manufacturing process and the inherently high-fat content of such treats. However, if you’re able to choose a product that is able to address these concerns, then you’d be able to provide your hound from puppies to seniors a really delicious and hearty treat. These can serve as excellent dental chews as well. To help you identify the best pig ears for your canine friend, we’ve created a list of some of the best-selling pig ears for canine consumption in the market today. 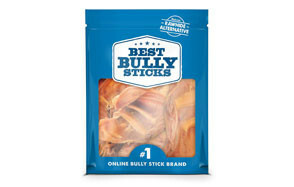 The Best Bully Sticks deserves its name as it happens to produce one of the best-loved pig ears for dogs in the world – the USA Pig Ears All Natural Dog Treat. The slow-cooked oven-baked process help provide for a healthier nutrient profile that has almost the same nutrition as conventional dog treats. With a minimum of about 22% protein and 17% fat, the Best Bully Sticks somehow mirror the nutrition profile of dog food. At the very least, you’ll find comfort in the fact that the fat content is not anywhere near 30%. There are no preservatives or other synthetic substances in the formulation. Everything is natural whole pig ears for your pet to chew on. You don’t have to look far if it’s quality and safe pig ears you can give to your pet that is you’re after. Brutus & Barnaby’s Whole Pig Ear gives you large pig ears sourced from the livestock of South American farms that, to this very day, still use age-old livestock-growing practices sans the use of chemicals and growth enhancers. While the whole pig ears are sourced from South America, you can feel safe that its processing is done in the good, ol’ US of A. It doesn’t include any dangerous chemicals in its processing. The pig ears are cooked to lock-in all the delicious flavors of the treat including its nutrients while drawing as much moisture and fat as possible. Anyway, if you’re not satisfied you can always ask for your money back. Downtown Pet Supply’s Pig Ears are always a joy to give to hounds especially large and giant breeds. The jumbo size of the Downtown makes it the ideal long-lasting treat for mild to moderate chewers. Heavy chewers can easily complete the feat within a few minutes, however. Downtown oven-bakes its treats and then carefully smoked to draw out as much moisture as possible, helping improve its shelf life while giving it its characteristic crunch that dogs have learned to love. There is nothing artificial about the Downtown Jumbo. You can bet you’re giving your pet the most natural treat for it. 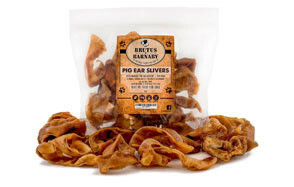 Designed primarily for puppies as well as mild to moderate chewers, the Brutus & Barnaby Pig Ear Slivers is a delectable treat that’s perfect for improving your hound’s oral health while taking care of its chewing habits. The thick pig ears are pre-cut into smaller bite sized pieces so you can effectively give them as is. Safety is always ensured with the products of Brutus & Barnaby as the ingredients are sourced only from USDA-certified farms. This is a very important consideration since you don’t want your dog to be chewing on something that has serious manufacturing issues. The Pig Ears of 123 Treats is just like any other doggie treat that is helpful in nurturing their natural tendency to chew. It has a guaranteed analysis of about 60% protein and 27% fat at the minimum. The fat content can be a concern, though if your hound is already obese. So moderation should always be observed. Regardless, 123 Pig Ears are guaranteed fresh up to a year and has a storage life of up to 5 years. The pig ears are sourced from USDA-certified farms and cooked without adding any harmful ingredients. Roasting pig ears has always been a favorite since dry heat naturally melts a lot of the saturated fat that may be present in the delicacy. What many pet parents love about the Happy Dog Place Large Roasted Pig Ears is that it comes in random sizes. While some pet parents may actually find this to be an issue, most welcome it since they can cut up larger-sized ears into smaller bits. The pig ears are all sourced and made in the US so safety and quality should already be a guarantee. If you’re a fan of smoked delicacies, then you may want to give your pet the Sawmill Creek Smokehouse’s version of their large pig ears. Batches of pork appendages are sourced from USDA-certified farms in the US and then slow-cooked for a full 2 days in all-natural hickory smokers. There are no preservatives added or any spices or herbs included in the formulation. The smoking process also helps reduce the fat that is associated with pig ears while the hickory-smoked goodness is sure to get your pet wanting more. If you are entertaining the idea of getting pig ear dog chews for your hound, you may eventually find that the process is actually not that easy. We understand the predicament of many pet parents who may have an idea about pig ears but may not be sufficient so as to make an intelligent buyer’s decision. This is the reason why we’ve prepared this guide just for you and hopefully answer some of the questions you may have about this type of dog chews. What are Pig Ears for Dogs? Pig ears are doggie treats or chews that are processed from pigs’ ears. Yes, it is the same organ that we use to listen to our favorite songs and to converse with our family and friends. Pig ears are just that – the auditory appendages of swine. Unfortunately, like everything else, just because it is labeled as “pig ears” doesn’t automatically mean that it is already safe to give to your pet. These dog chews are excellent alternatives to rawhides. And because of this, you can expect some unscrupulous entities who might take advantage of the product’s growing popularity. What you may have is a pig ear that is not really sourced from pigs. They may be made of synthetic materials and then shaped into that of a pig ear (Think meat that is actually made of vegetables!). Pig ears should be just that – pig ears. There should be no added chemicals such as flavor enhancers, coloring, or even preservatives. These should be processed in such a way that it locks in all of the good stuff and draw out all the bad stuff. 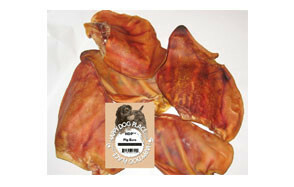 Pig ears for dogs are mostly blanched, dried, and then dehydrated. Many are oven-baked or roasted to draw out as much moisture as possible. Smoking is also becoming common as a means of infusing more flavors and aromas into the pig ear. Whatever the case, moisture should be removed at all cost. It is this moisture that some products simply don’t last that long because of spoilage. The fat content of pig ears must also be reduced since this part of the swine’s body is naturally filled with saturated fats. Baking and roasting can help ‘melt’ the fat and drain it away from the ear. If you’re not sure whether pig ears are the right chews for your pet, you might want to take a look at the following pros and cons of such a dog chew. It’s a delicious treat that dogs really love. This is especially true for smoked versions as the smoky flavor of the pig ears greatly enhances its palatability. The cartilage in pig ears is rich in chondroitin and other minerals that can help improve the health and functioning of your dog’s joints. It doesn’t leave a nasty odor in your pet’s breath. It is rich in protein especially amino acids that are crucial for tissue-building processes. Amino acids are also easier to digest and process than whole proteins. It’s a great and flavorful way to clean your dog’s teeth and keep its gums relatively healthy. This is not advisable for power chewers as they can literally consume it within seconds, making it a very expensive treat. It is very high in saturated fat. If the processing did not remove as much fat as possible, then you’re essentially increasing the risk of developing cardiovascular diseases in your dog. As much as possible choose pig ears that have guaranteed fat content of less than 20%. Otherwise, you need to compensate by reducing the fat content in its dog food. There can be indigestion and diarrhea in cases where the pig ear contains too much fat. Power chewers can also chew off large chunks of the pig ear, potentially blocking the esophagus or other parts of the gastrointestinal tract. If not processed properly, you risk introducing salmonella to your dog. There was a time in 2011 when 6 pet food manufacturers voluntarily recalled their pig ear treats because of concerns of salmonella contamination. In choosing the best pig ears for your dog, there are a few things you really need to consider. Here are some of them. Be very careful when you buy pig ears as there are many products that say they are pig ears but are in fact pig hide that has been trimmed in the shape of swine ears. While these are still part of the pig, they have a very different composition when compared to natural pig ear dog chews. There are also products that come in strips. These are okay as long as the source material is still a natural pig ear. There should be no added ingredients or chemicals in the production of the pig ear dog treats. Some may come with smoky hickory flavor, but you’d have to check if the flavoring is the result of a natural smoking process or the infusion of an artificial flavoring. If it is the latter, then check another brand. It is important to always check the label. If there’s no ingredient list, attempt to contact the manufacturer and ask for information. If you cannot get any, you’d be better off with one that can provide you the information you need. We may be biased, but US manufacturers have to adhere to very strict standards set by both the FDA and the USDA. These are two organizations that you need to seek in every label of dog treat that you intend to buy. We don’t have any issues with China, but their manufacturing processes have been put in a negative light for many years. Unless they can get their act together and ensure safer and higher quality products, we’d strongly recommend sticking with US-made products. Q: Are pig ears safe for puppies? A: The short answer is “yes,” pig ears are generally safe for puppies. They are more tender than other types of dog chews. However, since these are naturally high in fat moderation should be observed, lest you risk giving your young hound diarrhoea. Also, since pet ears are more tender than rawhide, they can be easily broken down into bits especially by young power chewers. As such, it is imperative that you supervise your puppy whenever giving pig ears. Q: Are pig ears safer than rawhide? A: Pig ears are usually taken as great alternatives to rawhide, but is it generally safer? Rawhide is made from the inner layer of the skin or hide of cattle. As such they are still considered as animal-based treats. Unfortunately, this is where issues about safety come in. One of the major issues being thrown against pig ears is that it may be contaminated with salmonella. Unfortunately, the same is true with rawhide. There have also been reports of salmonella contamination in certain rawhide products. Another issue is that of esophageal and intestinal obstruction brought about by larger bits of dog chews breaking off and getting lodged in the dog’s esophagus or small intestines. There is also the issue of diarrhea. These concerns are present in both pig ears and rawhide so one can never really pinpoint which is safer. Are pigs safer than rawhide? Not necessarily. But if you consider the more tender nature of pig ears compared to beef rawhide, then perhaps the main issue here will be in the digestibility of the dog chews. And for that, we can say that pig ears are more easily-digested than rawhide. Q: Why choose animal ears as treats for dogs over other options? A: One of the reasons why animal ears are preferred over other options is that this part of the animal’s body is rich in proteins and amino acids. More importantly, it is rich in chondroitin, a natural substance that is found in cartilage tissues. And since the ear is made up mostly of cartilage, this is one of the most distinct advantages over other types. For instance, rawhide doesn’t contain chondroitin for the simple fact that it is essentially made up of collagen and other tissues of the skin. Animal ears also have these substances so there really isn’t something that other options may have as an advantage over animal ears. Buying pig ears to give to your pet dog requires choosing only those produced by reputable manufacturers so you’ll know it is safe to give to your hound. You can also start by picking any one of the best pig ears we’ve listed in this article to give you a headstart.